Sensei Mori's contingent to the ITKF National Championships, Chicago, October 15, 1995. 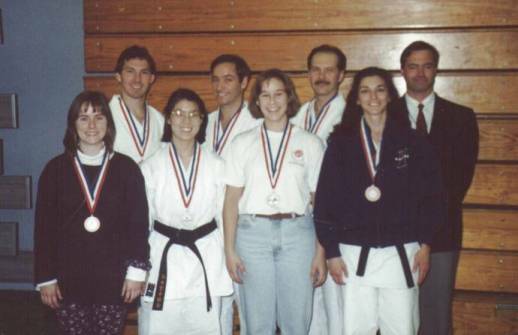 From left: Julie Westmoreland, John Seifert, Susie Lee (2nd place womens kumite), John Henderson, Kathy Kline, Mark Blake (4th place mens kata), Matte Thomas (3rd place womens kata), Bob Jacobs. The Connecticut team (Blake, Henderson and Seifert) took 1st place in Team Kumite and Team Kata.